If you would like to learn how much our qualified end of tenancy service will cost you, contact our day-to-day client care. You are able to do this by dialling 020 3404 0500 or by using the online contact form. To book us for doing the cleaning while moving out, you should first make certain that your stuff will be moved out in advance. In case you have troubles with the relocating process, our company also offers professional packing and man and van services to help you move. Our perfectly-equipped and prepared cleaning staff will arrive to your property or home and will utilize all tools and options necessary to diligently clean the entire property in compliance to the detailed tenancy cleaning checklist. This service is simply not limited in time period, so the cleaners will maintain cleaning until each and every task is checked off. The cleaning includes top to bottom cleaning of almost all rooms, steps, hallways, the kitchen and the bathing room. It can contain outdoor cleaning too. Excellent Carpet Cleaning is a qualified post tenancy cleaning company which has successfully provided the people and organizations of Worcester Park KT3 ever since 2004. Through the years, we have specialised in delivering professional move in and out cleaning services for all regional residents. The service is helpful for: tenants, companies, property owners as well as for people who are buying or selling a property or home - private or commercial. 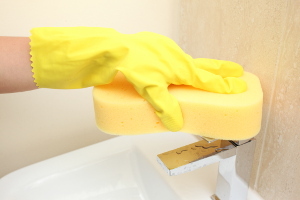 We have created a complete end of tenancy cleaning register which is strictly followed by the cleaners. This register has been accepted by a wide variety of regional landlords, property managers and estate agencies as what they really expect from the cleaning at the end of your tenancy agreement, in order that they do not hold back part or all your rent deposit for additional cleaning fees. We now have hand-picked all of our cleaners, background inspected them for police data and have trained them to work with our contemporary expert cleaning machines, methods and Prochem certified solutions. All of the end of tenancy cleaning clients receive a forty-eight hr assure, so if there is a issue, we will return and clean the property for a second time free of charge! To ensure that no money is withheld for cleaning prices by your property owner, reserve our skilled and high quality guaranteed end of tenancy cleaning service right away! We could carry out an end of tenancy cleaning service just after your entire items have been moved out. To reserve our professional re-locate cleaning service, all you need to do is contact our 24/7 customer support centre. You can do this by either calling 020 3404 0500 or by making use of the simple online booking form here. Written affirmation will be sent to you via text message and e-mail pretty soon. We work 365 days a year, and can provide you with a same day end of tenancy service just in case of emergency. No advance payment is necessary at the time of the reservation. We offer big special discounts for clients who book more than One of our services at a time. Property owners, real estate companies, standard clients and those who book earlier ahead will receive useful rates. Select our completely insured, high quality assured, professional end of tenancy service and reserve it right now!